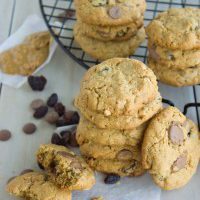 These Peanut Butter Chocolate Chip Cookies are gluten-free, low in sugar and have no oil, butter or flour added! 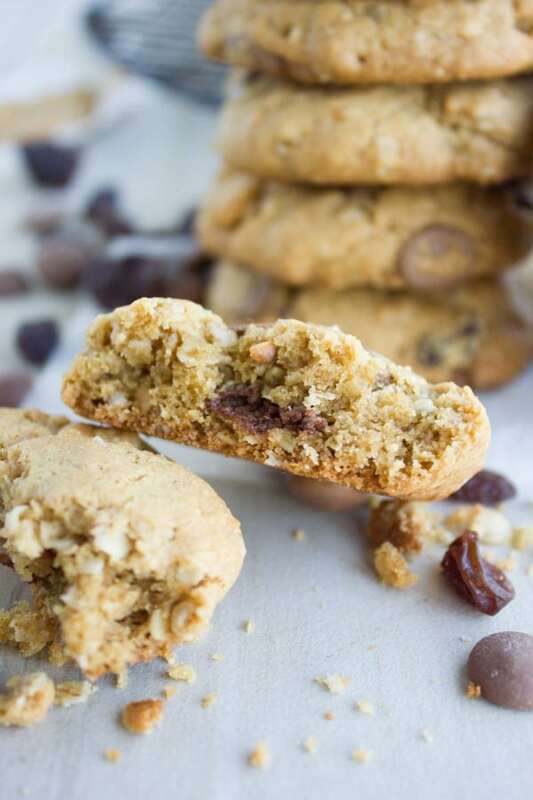 These soft and chewy cookies with melty pockets of chocolate are a heavenly treat and the perfect lunchbox snack for kids! They’re healthy, chewy, puffy, chocolatey bites of sweetness rounded all off with peanut butter goodness. 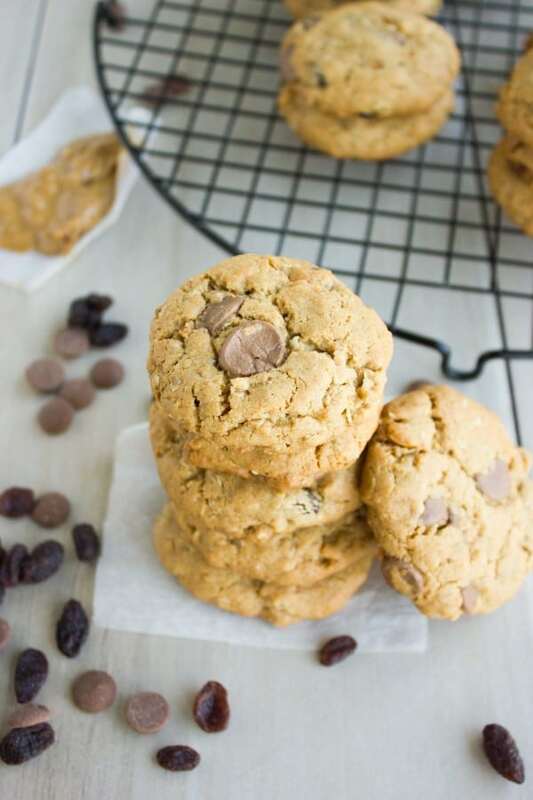 These simple cookies are a healthy twist on your good old peanut butter chocolate chip cookie, made with just two tablespoons of butter and no flour—so you can get all the cookie flavor with less of the guilt. 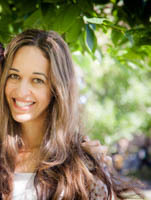 Got dietary restrictions? 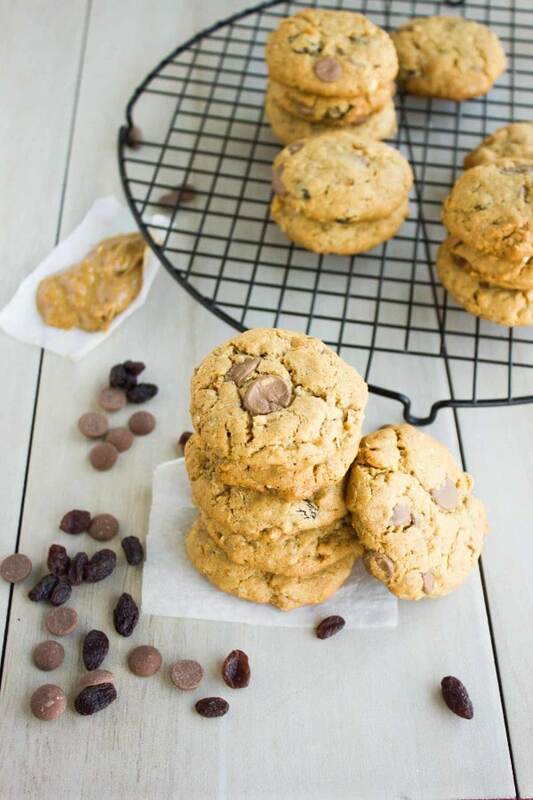 These Peanut Butter Chocolate Chip Cookies are your new go-to! Kid-approved, mom-approved and, obviously, also approved by me. A while ago, I was asked to make a tray of peanut butter chocolate chip cookies for a friend’s baby shower—you can’t decline a pregnant lady’s request, can you? The lady wanted a healthy peanut butter chocolate chip cookie that has minimal to no oil or butter added, just the good fat from the peanut butter. 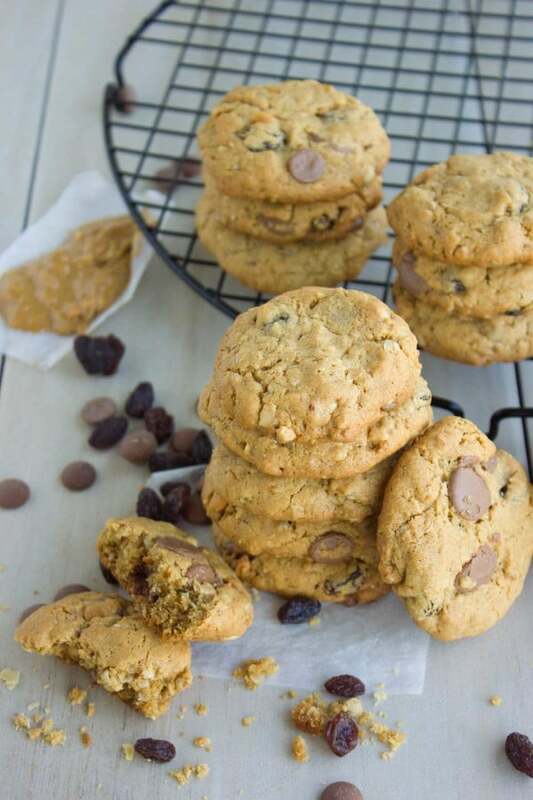 The peanut butter chocolate chip cookie should also not be too sweet but bursting with peanut butter flavor and chocolate chips. Also, her perfect peanut butter chocolate chip cookies should have some oats but and be gluten free if possible. Then she asked for a nice puffy cookie that is chewy with some crunch from the nuts. I went out and got quite a few jars of peanut butter, made a whole bunch of peanut butter chocolate chip cookies, out of which I should say some had to be thrown out. And after a week of continuous peanut butter cookie baking, the pregnant lady approved of this batch of peanut butter chocolate chip cookies – what a relief! After that I took a long long break from anything peanut butter, chocolate chips and cookies! 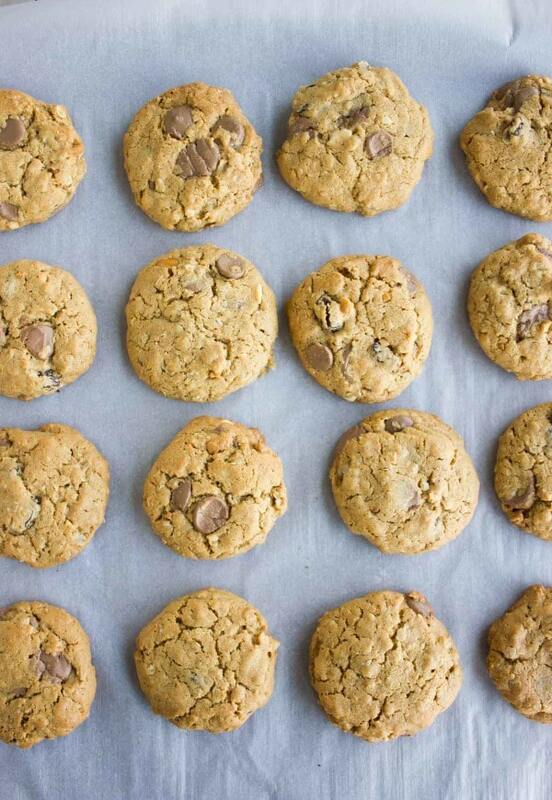 These peanut butter chocolate chip cookies come together easy as 1-2-3. Whisk up in a bowl a tiny bit of butter, peanut butter, sugar and an egg. Then add in some oats, flax powder (or whole wheat flour), baking soda, chocolate chips and raisins. Take spoonfuls of this cookie batter, bake them for 12 minutes and you’re good to go! Raisins are not a common thing I know, but they add a touch more of sweetness. I used crunchy peanut butter so that I don’t have to add any more nuts. 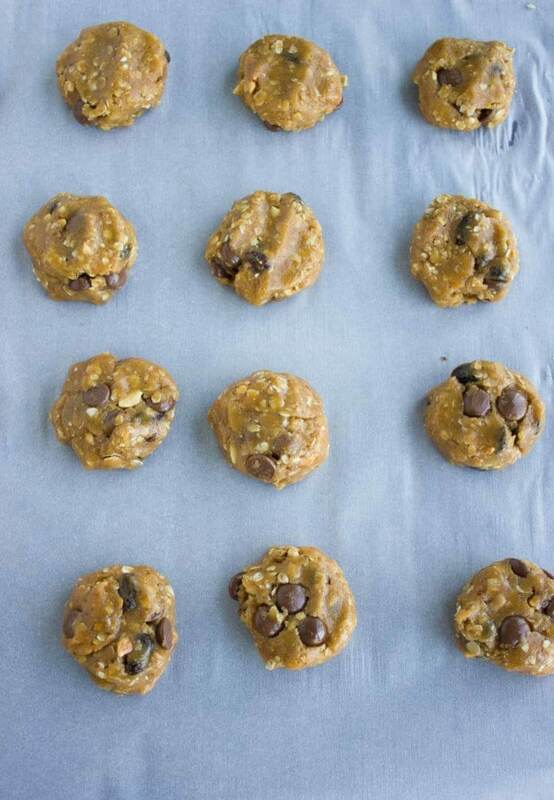 Feel free to make them with smooth peanut butter and add some chopped nuts to the chocolate chip cookie batter. 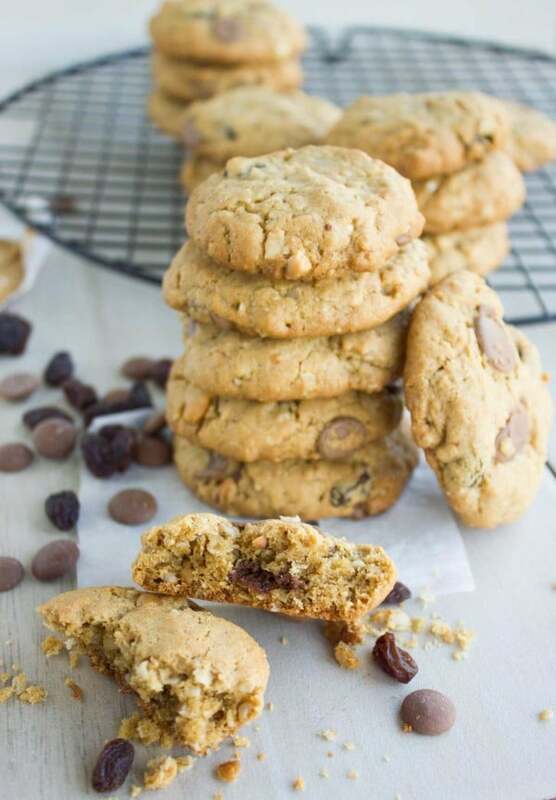 Instead of raisins, you can add cranberries or any other chopped, dried fruit to your healthy chocolate chip cookies. 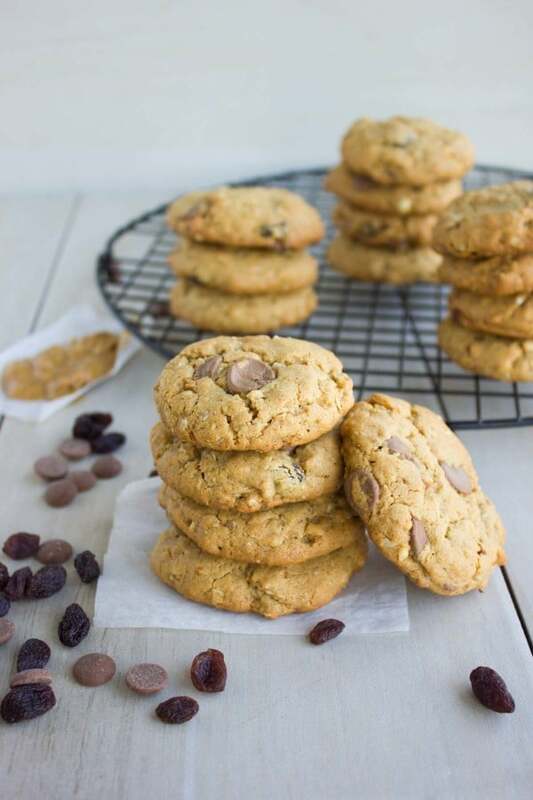 Make these healthy Peanut Butter Chocolate Chip Cookies vegan by using a flax egg instead of a chicken egg. If using smooth peanut butter instead of crunchy, add some chopped nuts for some extra crunch. 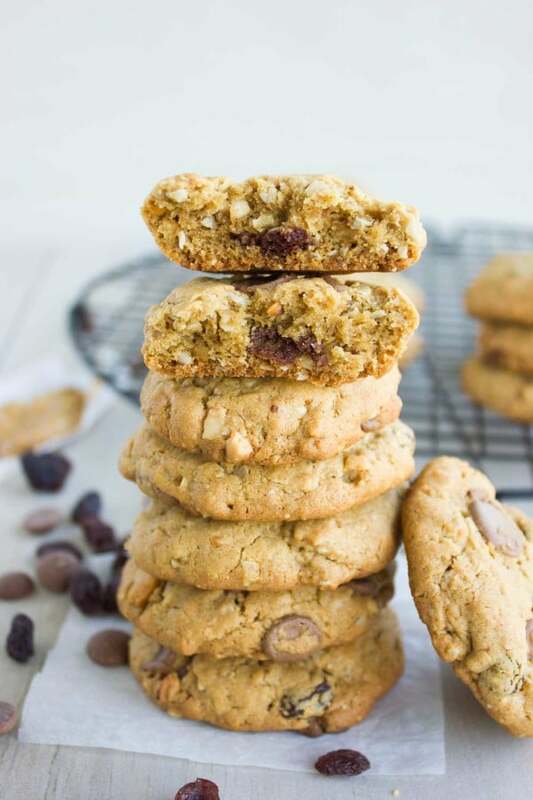 You can’t miss my number one recipe on the blog-these Healthy Oatmeal Raisin Cookies and a vegan version if you want: Vegan Oatmeal Raisin Cookies. Finally, a decadent divine cookie would be Loaded Chocolate Brownie Cookies. Enjoy and Happy Baking! In a large bowl, whisk together the butter, peanut butter, sugar, and egg until smooth. Add in the pinch of salt and whisk well. Add the oats, flax powder and baking soda and use a rubber spatula to mix them in the dough. Then add the chocolate chips, raisins and extra nuts if you prefer. Mix them well. Take a tablespoon and scoop out tablespoons of cookie dough on to a parchment lined baking sheet and place them an inch apart. Bake the cookies for 10-12 minutes (depending on the size of your dough) until the edges are firm but the centre of the cookies are still very soft. Allow the cookies to cool on the baking sheet for 2 minutes and then cool on a wore rack.